What do you do when your little island nation is under the constant implied threat of military annihilation from China, and China launches its first ever aircraft carrier? Debut your fancy new aircraft carrier-destroying missile. Complete with scary artwork! 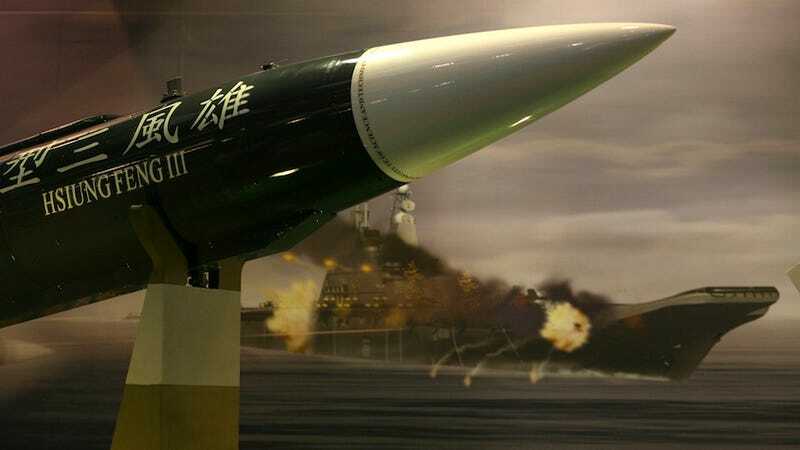 Taiwan, completely coincidentally of course, revealed their Hsiung Feng III "aircraft carrier killer" missile to the public today, just as China's Shi Lang began cruising through the seas. In case that wasn't explicit enough, the Taiwanese decided to put a giant billboard of an exploding, sinking aircraft carrier behind the missile. Oh, and the aircraft carrier just happens to look a lot like China's aircraft carrier. Weird!